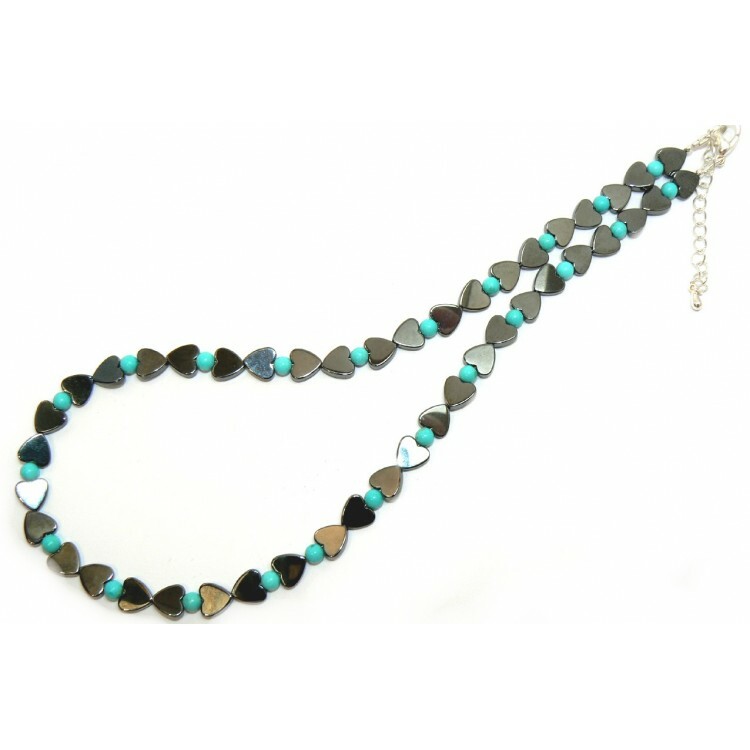 Hematite Hearts and Turquoise Necklace. Hematite Hearts and Turquoise Necklace. Delicate and finely crafted with a petite woman in mind. Lightweight and comfortable to wear. An ideal gift of beauty, that will always be remembered. Hemitite a common mineral, silvery, shiney, yet opaque stone that almost looks like metal. I have mixed this with turquoise to give that surperb look of quality to this stylish piece of jewellery. Turquoise is one of the first gemstones ever to be mined, and is famed for its intense colour, which ranges from green to sky blue. The colour variations are due to the amounts of copper and iron present. This necklace measures 18.5" (47cm) long and I have added a silver plated "nickel free" clasp and extension chain to comply with EU directives. Turquoise is the birthstone of Sagittarius : Nov. 22-Dec. 21.